Factory Sig Sauer P320/250 Grip Module allows the shooter to tailor the pistol to meet their specific grip size requirements. Black polymer construction. This is the small grip for the 9mm, .40S&W and .357SIG P320/250 Compact. New style grip module with picatinny rail. Only new style P250 magazines will fit this module. Great decision! Was afraid that a small grip would be too smal for my medium size hands. Really like the fit - can get solid purchase on the grip for rapid shots. I received the grip, very quickly and it didn't require any modifications. I am pleased with your quick and economic service. 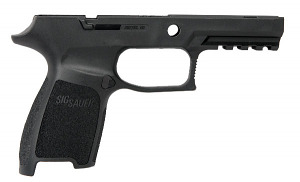 Standard small grip by Sig at a lower cost. Fit well and allow a better grip and trigger control for me. Order was shipped within 24 hours.